ISG operates is an international construction services company that operates in 24 countries. The head office located in Aldgate in central London, has recently been refurbished to a high standard by Tailor Made Joinery (TMJ Interiors). Commercial washroom designer and manufacturer, Washroom Washroom, worked closely with TMJ Interiors and ISG to deliver new male and female washroom areas on level six of the building. Bespoke trough-style Corian vanity units were installed with Corian under panels for a unique washroom space. They were supplied in the Deep Night Sky shade, for an attractive statement look. The solid surface construction of Corian means the colour runs consistently all the way through for a perfectly neat and unified appearance, creating an attractive finish. Tego hinged access mirrors with curved edges and LED back-lights were then installed above the vanity units to provide a practical storage solution. Washroom’s full height, floor-to-ceiling, Alto toilet cubicles were specially tailored to meet the requirements of this project. The flush fascia cubicles, which form part of the company’s unique Iconica Collection, were faced on both sides with Formica AR Plus High Gloss laminate in Diamond Black, while the pilasters were manufactured using oak effect HPL laminate for contrast, creating a distinctive and contemporary washroom space. In addition, Washroom’s Concerto integrated duct panel system was installed to allow for ease of access for future maintenance, whether planned or reactive. As well as being easy to clean, the duct panels were faced with the same Formica gloss laminate in Diamond Black to match the toilet cubicle doors, bringing the different elements of the design together. 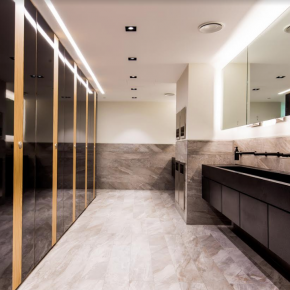 Washroom also installed a number of self-contained unisex superloos to exactly the same design as the larger washroom areas, ensuring consistency of design was achieved throughout the building while maximising available space.